Your guide to understanding what it is and what it can do. 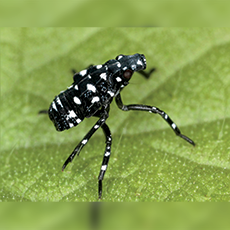 The spotted lantern fly is an invasive sap-feeding planthopper, first discovered in the United States in Berks County, Pennsylvania in 2014. 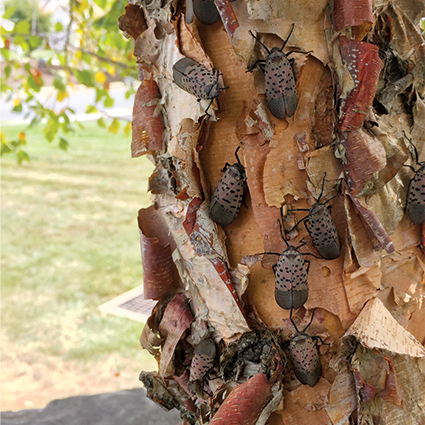 Field observations indicate that the tree of heaven, Ailanthus altissima, is an important host plant; however, the spotted lantern fly is known to feed on a wide range of hosts including wild and cultivated grapes, stone fruits, willow, and various hardwoods. 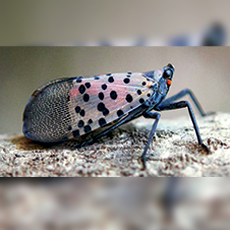 Given the wide range of hosts it feeds upon, the spotted lantern fly poses a serious economic threat to multiple U.S. industries, including viticulture, fruit trees, ornamentals and timber. Given that egg cases are deposited on such a wide variety of surfaces, this is the life stage that may have the greatest potential for spread via accidental transport to new areas. Although adults are capable offight, they are relatively weak flyers, relying instead on strong jumping to evade danger. Mated females pose a high risk for establishing new populations by accidental transportation on vehicles, such as open bed trucks, and introduce their offspring to new areas. 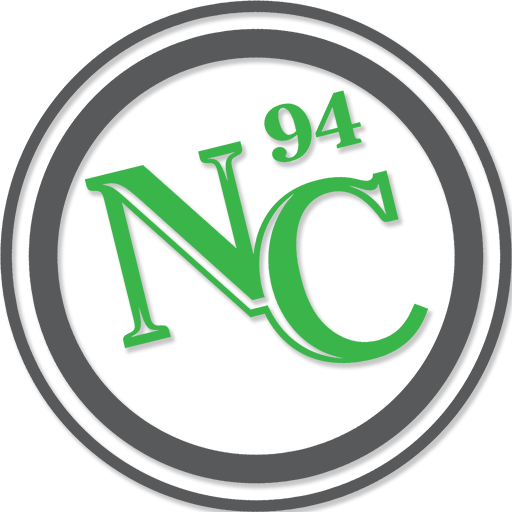 Infested municipalities are under a quarantine that covers all living life stages of the pest and its conveyances. 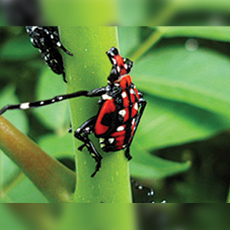 Symptoms from the spotted lantern fly populations can be an unpleasant nuisance to homeowners. Host plants fed upon by congregations of adults may exhibit weeping of sap along the trunk as well as build ups of honeydew excrement. Black sooty mold fungus grows on the honeydew on the tree as well as on surrounding soil and understory plants. 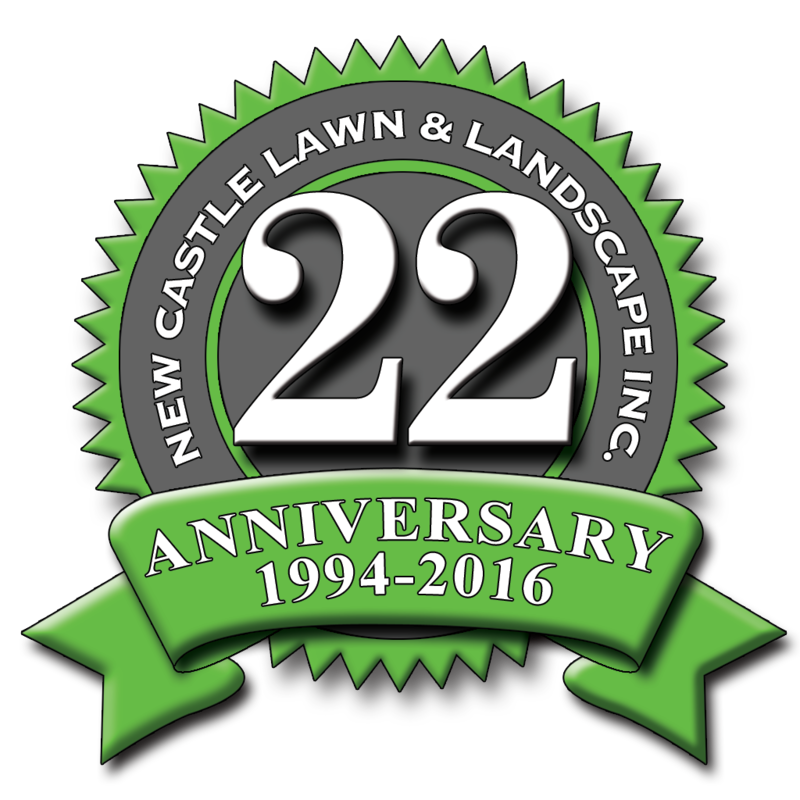 Weeping sap and/or honeydew build ups attract ants, bees, wasps, hornets, and flies. 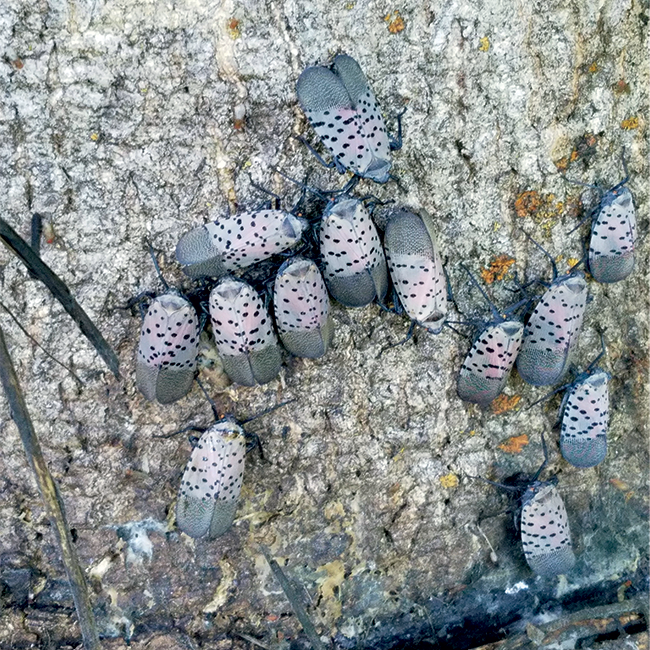 The spotted lantern fly population overwinters as egg masses (1) and has a one-year life cycle. In Pennsylvania, the first nymphs (2) hatch in late April to early May and are less than an inch long. Nymphs (3) develop, all of which are wingless and incapable of flight. Adults (4) begin to appear in mid-July and are approximately one inch long and inch wide, with wings folded. Adults mate in late summer to early fall in Pennsylvania and form large congregations. Although these have been observed on birch, oaks, willow, maple, and other tree species, they most commonly occur on the tree of heaven. Females lay eggs from late September through October and dozens of egg masses can be found near adult aggregations. Eggs are deposited on tree trunks, limbs, and loose bark as well as any smooth surface, including stone, vehicles, trash barrels, outdoor furniture, and other man-made structures. 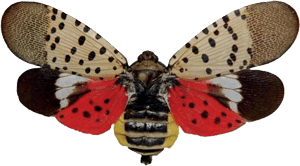 Management efforts are targeted at multiple life stages of the spotted lantern fly. Egg masses can be scraped off of surfaces where they are found. Brown sticky bands are effective in catching nymphs on trees. Adults are controlled using a combination of Ailanthus host reduction and the establishment of trap trees treated with systemic insecticide, which has shown to be capable of removing significant numbers of adults in the population. YOU CAN HELP CONTROL THE SPREAD!